Bliss is defined as a great joy or happiness. And that is what you will feel from the minute you walk through the door. Bliss means soaring ceilings, lots of glass and a wonderful mountain view plus all of the amenities required for a perfect honeymoon or romantic getaway. Bliss has king bed, indoor jacuzzi, outdoor hot-tub, pool table, a 32" flat panel satellite TV+DVD in the bedroom and a 40" flat panel satellite TV+DVD in the living area, wood-burning fireplace, queen sleeper for the kids, full kitchen, washer & dryer and charcoal grill. It is very conveniently located between Pigeon Forge and Gatlinburg -- not more than a 5 or 10 minute drive into either area or into the Great Smoky Mountains. One visit and you will be in a permanent state of Bliss! One private bedroom plus small bunk room for children. 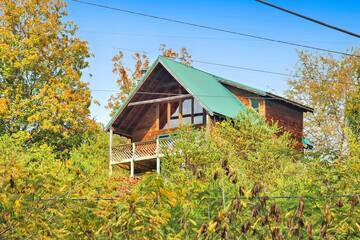 Sleeps 2 adults and 4 children, age 12 and under. Noah's Ark is a unique and private cabin surrounded by lots of trees. It features a king master suite with full bath and 2-person jacuzzi tub and access to the outdoor hot-tub on a private deck that is perched up in the trees. There is a separate cozy kids suite with twin bunks & a full bath. There is a queen sleeper sofa in the living area with a wood-burning fireplace, a pool table & a 32" flat panel cable TV+DVD and free WiFi. 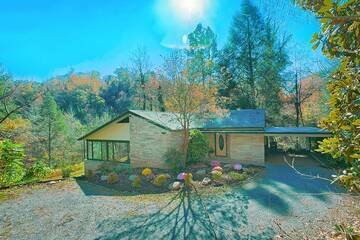 The large screened porch area is private and peaceful with a wood-burning fireplace. 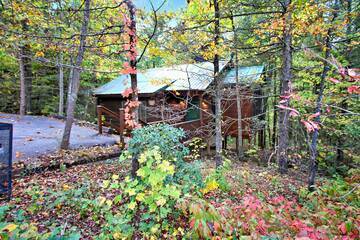 The fully-equipped kitchen has large windows that take in the private wooded setting. It also has a washer & dryer and a charcoal grill. Noah's Ark is conveniently located off Hwy 441 between Pigeon Forge and Gatlinburg. 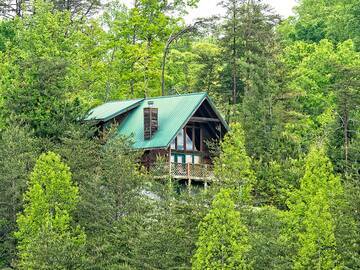 It offers great privacy yet is no more than 5 minutes to either area or to the Great Smoky Mountain National Park. The loft bedroom has King-size bed and two-person Jacuzzi tub, 32" flat panel cable TV+DVD. The living area features a wood-burning fireplace, queen sleeper sofa for the kids! a pool table, a 32" flat panel cable TV+DVD and free WiFi. The kitchen is fully equipped and has a full size washer & dryer. The deck is totally private for soaking in the hot-tub under the stars. 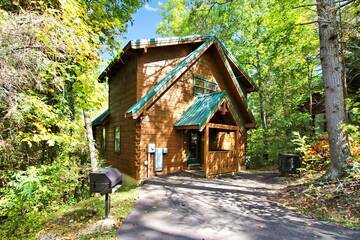 Orchid Hideaway is conveniently located right between Gatlinburg & Pigeon Forge not more than a 5 or 10 minute drive into either area or into the Great Smoky Mountains National Park. Enchanted offers vaulted ceilings and lots and lots of glass for enjoying the fabulous mountain view plus all of the extra amenities required for a romantic honeymoon or weekend getaway. Enchanted has a king bed in the loft with 32" flat panel satellite TV+DVD, indoor Jacuzzi & full bath. Other great amenities include an outdoor hot-tub, pool table, 32" flat panel satellite TV + DVD in the living area, a queen sleeper sofa for the kids, full kitchen, washer & dryer, wood-burning fireplace and charcoal grill. 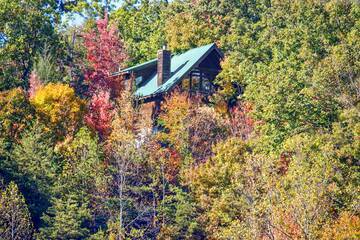 This is the perfect cabin if you need a little "Enchantment" in your life. Serenity is a feeling of calm, peacefulness and solitude and being away from it all. Serenity offers all of this and more! It is conveniently located between Pigeon Forge and Gatlinburg -- not more than a 5 or 10 minute drive into either area, yet you will feel miles and miles away. Serenity offers vaulted ceilings and lots and lots of glass for enjoying the fabulous mountain view plus all of the extra amenities required for a romantic honeymoon or weekend getaway. Serenity has king bed in the loft with a 32" flat panel satellite TV+DVD, indoor Jacuzzi and full bath. There is an outdoor hot-tub, pool table, a 32" flat panel satellite TV+DVD in the living area, a queen sleeper for the kids, full kitchen, washer & dryer, wood-burning fireplace and charcoal grill. 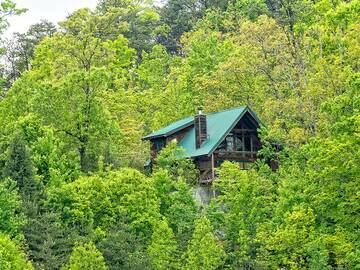 A stay at this cabin will give you a little "Serenity" in your life. & Gatlinburg yet you will feel miles and miles away. Grandma's Gift has a king bed in the loft area, indoor 2-person Jacuzzi tub, outdoor hot-tub, pool table, a 48" flat panel cable TV+DVD in the living area, free WiFi, fully equipped kitchen, washer & dryer, wood-burning fireplace, and a charcoal grill. 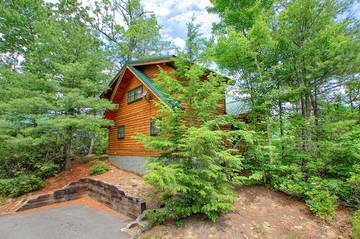 It is the perfect cabin for a honeymoon, a romantic getaway weekend for just the two of you or a family vacation with the kids. Mystic is situated in a very private wooded setting with great mountain views and offers luxury & privacy for a romantic honeymoon or a quiet weekend getaway. 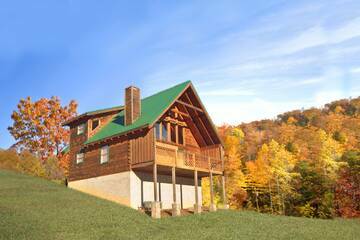 It is conveniently located between Pigeon Forge and Gatlinburg and easily accessible to either area or the Great Smoky Mountains National Park. The bedroom is the loft with a king bed, 32" flat panel satellite TV+DVD, jacuzzi tub and full bath. The living area has vaulted ceilings and lots of glass for enjoying the fabulous mountain views, a 32" flat panel satellite TV+DVD, pool table, full kitchen and full size washer & dryer. 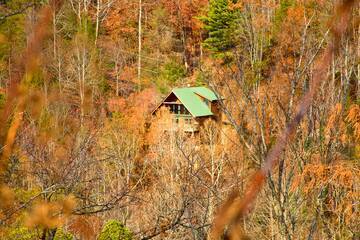 The private deck features a large hot-tub overlooking a fabulous view of the Great Smoky Mountains. Tucked away among the trees, but with a great mountain view, JT's Jungle is a granite stone and wood-sided cottage perfect for a quiet getaway. The stream that runs below the house provides a constant, soothing sound for those lazy afternoon naps.